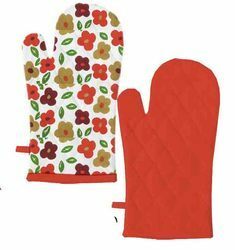 We are a leading Manufacturer of big floral pinted dog oven glove, colorfull digital printed double oven glove, cotton mittens, pink rose flower printed double oven glove, plain red dyed cotton double oven glove and plain white flame retardant treated double oven glove from Karur, India. 100 % Cotton with Printed. Which is a hand weaved & power loom weaved . It is considered to be a "high end" fabric, this is a cotton yarn are used with good color fastness property. We present an interesting range of Cotton Glove that gives a unique and distinct look to your kitchen. We try to create a whole range of kitchen linen that helps in expressing a sense of style and modern outlook. They are more spacious such as cabinets, shelves and drawers for complete utility of the space. It includes aprons, pot holders, mitten / dish clothes and cheese cloth / napkins.